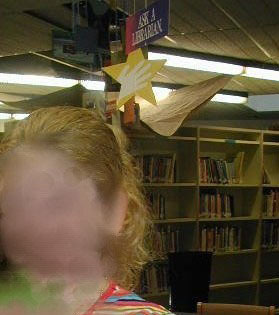 In 1983 I began working for the Liberty School District in Liberty New York as their elementary school librarian. In 1991 I moved up to the new Middle School Library serving grades five through seven. I worked at this position until June 24th 2004; also serving as the county’s summer school librarian from my library for most of those years. I can no longer work there. This is my story. The Liberty Middle School was built on an aquifer and into the side of a hill. 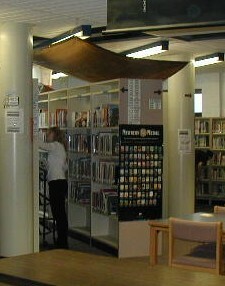 When it opened in the fall of 1991, there were active leaks in the library ceiling. Part of the library was under science labs and a greenhouse on the floor above it, and part was a circular jut out of the building with a skylight. Contractors hung several spackle buckets under the leaks and over the ceiling tiles. Many areas of the school continued to have moisture and water incursion problems. 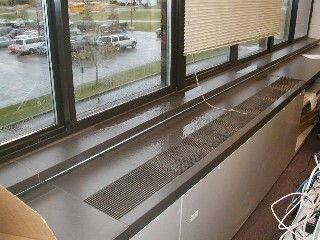 It was not uncommon for me to find water along the window ledges either near the books or in the computer area. 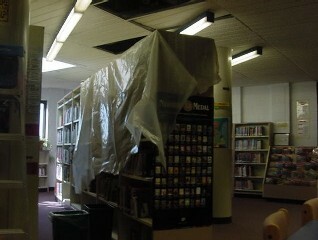 Many times I would find that ceiling tiles, heavy with rain or melted snow, had fallen overnight onto the library rug. 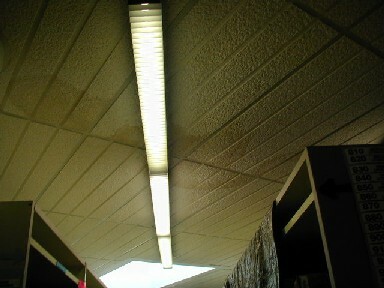 After years of replacing tiles, custodians hung a roof-sized tarp above the books under the strip lights and removed all the tiles where the leaking persisted. The tarp funneled the rain into garbage bins which I would empty. Over the years leaks were random and persisted. 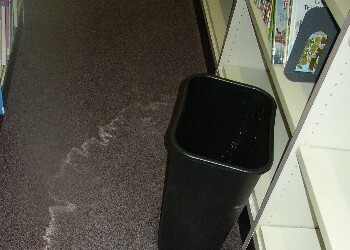 In January 2001, I wrote the the Superintendent at the time, Dr. B. Howard, saying: “the library ceiling has been leaking since it opened in 1991. I am so accustomed to the brown parachutes guiding the water and obscuring the light I don’t know what visitors are pointing to when they ask about them. Perhaps it is time for a peaked roof to be put on this area of the building.” The head custodian had informed me that requests he sent for what the roof needed were denied every year. While working at the school, I developed a dry cough. By 2001 and 2002, I was feeling disorientated at times and began to feel tingling in my extremities, especially my legs. In the summer of 2002, (I worked in that space as the county’s summer school librarian) my legs gave way and I fell to the floor in dizziness. The nurse suggested seeing a doctor. I did see a local pulmonologist who found how about no apparent medical reason to explain this. He suggested taking more iron. I did. I also joining the gym, going at 6 am to 7 am everyday before school month after month. I began to get increasingly dizzy, however. Away from the library I would have energy; waking early on weekends to handle volunteering on public radio and family commitments. I would sleep well and feel energized upon waking but once back at school I would feel extremely tired and disoriented. January 2004, I developed a sinus infection and missed some school. My cough was omnipresent. January 28th was a snow day. The following day I came in to see the ceiling tiles on the floor again, and began to tally the cost of lost books to the water damage as the principal asked me to do. I began to find the smell in the library extremely distasteful; an odor I couldn't place. February 3rd, 2004, I couldn’t bear to be in the room for the smell. I complained to janitors and asked other teachers in. Descriptions of the smell ranged from citrus to earthy. I thought it was pesticides but the custodians assured me they do not use them. By early morning, I blacked out. Losing control of my legs, I fell to the carpet again. I had to crawl out of the space. Another teacher found me on the hall floor and helped me get medical attention. I had a bad taste in my mouth like hot iron and it wouldn’t subside. I told the doctor I had been having trouble clearing my throat with a feeling of rubber cement stuck there not moving. I told him I felt poisoned. On March 23, 2004, I went to retrieve a book from the WWII section for another school district and discovered a section that wasn't cleared during the January 29th clean up. It was slimy and smelly and the shelf had other books in that condition. When I removed them the shelf was black. Immediately I became extremely disoriented, sick to my stomach, and fell to the carpet blacking out for probably a few seconds. (Later Texas Tech. University Health and Science Center, Department of Microbiology and Immunology would report 35,000 aspergillus versicolor, and 780,000 colony-forming units of penicullium chrysogenum per square inch on that book.) When I could function, I crawled out of the library and went outside to breathe. Then, I went straight to my principal who said that the library should close. I made another appointment with my pulmonologist to see me and he began a series of tests over the following months, as the school ran tests on the air quality of the room.There were times I was in another area of the building and could smell strong bleach in the air system from bleaching in the library. The school saw data from BOCES in March and April and decided it was safe to open the library on April 20th. When I did begin classes again, within fifteen minutes of opening students brought me at least four moldy and wet books. I was again feeling dizzy, and students commented on smells. I told the principal and he said we should close until I get some doctor reports. A decision was made to "remediate." Custodians carried the shelving and books to the hall and tore up the carpeting. They put down glued tiles and replaced the particle board shelving and books. School administrators ordered me back in to put away 13,000 books. The school had other air tests taken May 4 and May 12th. Before I saw the results of these tests, I was back in the space trying to ready it for patrons. I worked long hours, 6 am to 8:30 with family bringing me lunch and dinner, so as to get the library back in use again. What I didn’t realize as I continued to cough and feel foggy was that I was exposed to many molds and very high levels. Among these was (19:1) aspergillus versicolor, a mold which according to the EPA is "known to produce potent toxins ". As a result, my throat would close when I entered the library space at all. Added to the random numbness and disorientation I developed difficulty breathing and speaking. During the first week of June I was gasping involuntarily. I whispered so as not to aggravate a burn in my chest. I refused to return to the space which continued to cause me respiratory and physical distress. 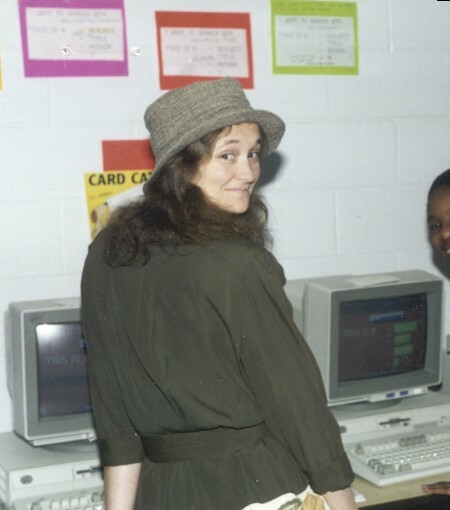 I worked on Middle School Library workm for the remaining few weeks of the school year, on computers in the high school library, still coughing. The summer of 2004 was spent with doctors and lawyers. I couldn’t serve in my usual position of summer school librarian, losing that income and expenses began to grow enormously. I saw Dr. R. Shoemaker of Maryland, a specialist in neurotoxic poisoning. In late September 2004, he appeared before the hearings on the Melina Bill and indoor air quality to speak about his work. 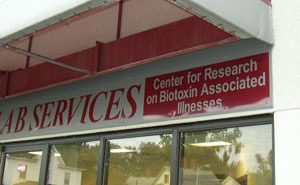 He has published four books on his experiences with healing neurotoxic poisoning of body systems: http://www.chronicneurotoxins.com and http://www.biotoxin.info. Under his care my cough has disappeared. I am, however, still coping with difficult reactions to all chemicals to everyday items (poisons) which my body cannot presently tolerate. http://www.herc.org/news/perfume/risks.htm. This complication is referred to as EI: Environmental Intolerance or Multiple Chemical Sensitivities. Any mold mycotoxin or chemical “hit” creates instant postnasal drip and a raw burning like open sores or swallowing whole hot peppers. The burn drops quickly from my throat to my chest and lasts sometimes for hours or days even once removed from the trigger. Doctors have advised me not to return to the Middle School, or work in any building with a history of dampness and water damage. The building has a 14-foot buried back wall, up against which secretaries are working in windowless rooms. They have experienced seeping water ruining their files. Nor can I work in the High School since this is an airborne illness and the schools are attached with heavy traffic flow. The only other school in our tiny district is an old elementary building with known mold issues in the ground floor and in the modular classrooms. Bonds passed late in 2007 have permitted the expense of over 38 million on a first leg of building new High and Elementary school libraries. When I called the EPA they informed me that indoor air quality is regulated voluntarily. The school remained wet after I left working there. Few know the truths of the leaking, the truths of the "assessment" and the "remediation" done. Persistent questioning of method and results and then an interpretation of the data is needed to assure a safe environment. Current laws allow me simply to be an expendable employee. I'm afraid that nothing will happen until parents and kids unite and educate themselves, after all, they are our clients.